Henry Cary Tompkins was born in 1824 in Castle Cary, Somerset, son of labourer John Tompkins and his wife Mary. In the 1841 census John and his family were living at Haysend (off Roping Path, close to Sparrow Road). John and Mary's family were Henry (aged 17, a glover), William (aged 16, a glover), George (aged 15, a clerk? ), Mary (aged 13, a female servant) and Elizabeth (aged 12, a glove sewer). In the winter of 1848 Henry married Emily Hunt in Yeovil. They were to have six daughters; Theresa Penelope (1849-1948), Emily (1850-1851), Emily F (1854-1879), Henryetta / Harrietta (b1855), Mary (b1856) and Matilda (b1858). In the 1851 census Henry and Emily were listed living in South Street, immediately next to Hawkin’s Court, a ‘court’ of low cost housing off South Street in the Wine Street / Peter Street area. 28-year old Henry gave his occupation as a glove cutter while 26-year old Emily gave hers as a glove sewer. Living with them were their two daughters; 2-year old Theresa Penelope and 6-month old Emily, as well as a visitor and a lodger. Sadly, in the autumn of 1858 Emily died, probably in childbirth with Matilda. It may be that Matilda did not survive for long since she is not recorded in later censuses. In the 1861 census Henry was listed as a widower living in Higher Street, Stoke-sub-Hamdon, some half-dozen miles west of Yeovil. He gave his profession as 'Foreman in a Glove Factory'. Living with him were his four surviving daughters Theresa, Emily, Henryetta and Mary. Also living with him were his two nieces, Mary J Wheadon (aged 23 and a Grocer) and Elizabeth Wheadon (aged 19 and a Seamstress). In the winter of 1863 Henry Cary Tomkins and Mary Jane Wheadon were married in Yeovil. The Post Office Directory of 1866 listed Henry as a 'Shopkeeper of Reckleford' and the 1871 census listed Henry, Mary and the four girls in Reckleford and Henry gave his occupation as 'Baker & Grocer'. He was also listed as Henry Cary Tomkins 'Grocer & Baker of Reckleford' in the Post Office Directory of 1875. Henry entered local politics and, certainly by the time of the 1881 census, politics was coming to the fore in his life as he listed his occupation as 'Town Councilor & Baker' rather than listing his trade first. 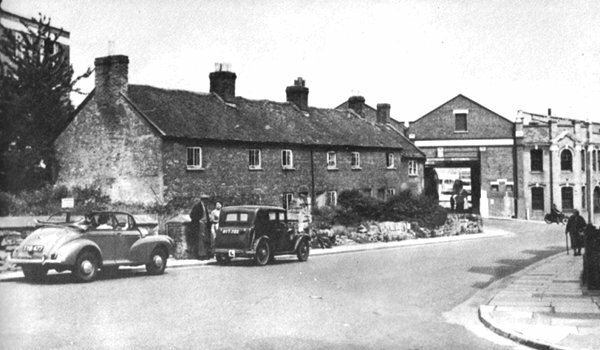 At this time he was 57 years old and living at 29 Reckleford, opposite Reckleford Terrace, with Mary (aged 42), Henrietta (aged 26) and his 58-year old brother John, a retired draper. Whitby's 1882 Yeovil Almanack Advertiser listed him as 'Henry Cary Tomkins, Baker & Grocer, 29 Reckleford' and he also placed an advertisement in this edition of Whitby's, shown below. The 1891 census listed Henry, Mary and John still at 29 Reckleford plus a young baker named Walter Saint. Henry still listed his occupation as 'Baker & Grocer'. 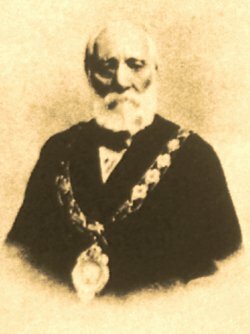 An Alderman of the Borough, Henry was elected Mayor of Yeovil and served in 1897-98 - the photograph of him above is his mayoral photograph of that year. Sadly Mary died in the summer of 1897, aged 59. In the winter of 1899, Henry Cary Tomkins died in Yeovil. He was aged 76. We do not live to eat, and it is equally a truism that we must eat to live, and similar businesses to that which now attract our attention are as essential to the general community as the sun is to the warmth and light of day. Mr Tompkins' business has been established for upwards of 30 years, and during that time has been allied to the combined interest of the bakery and grocery trades. To the first-named branch close attention has been paid, with the result that it has developed into a power for much good in the neighbourhood. The ingredients used in baking are of the purest character, and the shelves and counters are loaded with the choicest and freshest bread. The bakehouse, which is under experienced management, is a model of cleanliness, and the bread is wholesome and nutritious, the whole meal bread especially being much sought after and appreciated. The bread-baking department has always been in receipt of a large patronage, and as during the last two years upwards of 300 houses have been erected in the parish, it is but reasonable to assume that among the new residents many have discovered the advantages to be gained by supplying their pantries from this establishment. In the general grocery interest, Mr Tompkins has also achieved a marked success. He constantly holds a large stock of goods of all kinds - tea, coffee, sugar, spices, biscuits, pickles, sauces, tinned meats, laundry requisites, and many other goods, and having during his long experience always bought in the best markets he is enabled to supply really first-class and reliable articles at moderate prices. 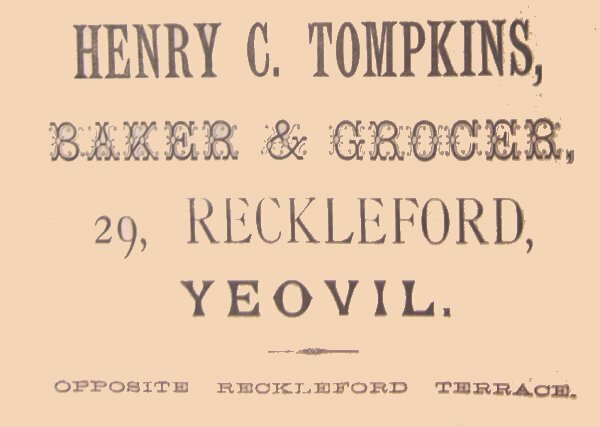 Apart from his business, Mr Tompkins is well known in Yeovil, having for the last twelve years officiated as Town Councillor, and during that time every movement which has for its object the welfare of the general community has received his cordial support. Henry Tomkins' advertisement in the 1882 edition of Whitby's Yeovil Almanack Advertiser. Henry advertised in Whitby's almost every year until his death - all his adverts were slightly different fonts but none more adventurous or inspiring than this, his first. Cottages on Reckleford by Goldcroft. Photographed in the early 1960s. These were demolished soon after this photograph was taken. One of them (not sure exactly which, but most likely the one at extreme left) was the grocery and bakery of Henry Cary Tomkins.